Your Holiday Present is Here! Do you like a good challenge? Then buckle up your space seatbelt and get ready for a ride. Our CEO Brad Wardell has been working on the game and has some serious updates to share! If you’d like to read a bit about his process, check out his posts here and here. To see everything that went into v1.9, make sure to check out the full change log below. Performance Optimization: A newly enhanced multithreaded system dramatically improves load times and reduces memory usage. A.I. and Balance: The AI has received a bit of a boost! You’ll notice that they are smarter about expanding, building fleets, and spreading influence, and more. Ready for the challenge? Rich, Unique Galaxies: Performance optimizations have allowed the addition of more stars and planets, making galaxies feel even more vast than before. This massive update has been brought to you thanks to your feedback. As always, we appreciate our community and we absolutely listen to what you have to say. If you have some thoughts on the update, please feel free to let us know in the comments! v1.9 is now available and waiting in your Steam client. To see the full list of changes, please check the change log below. 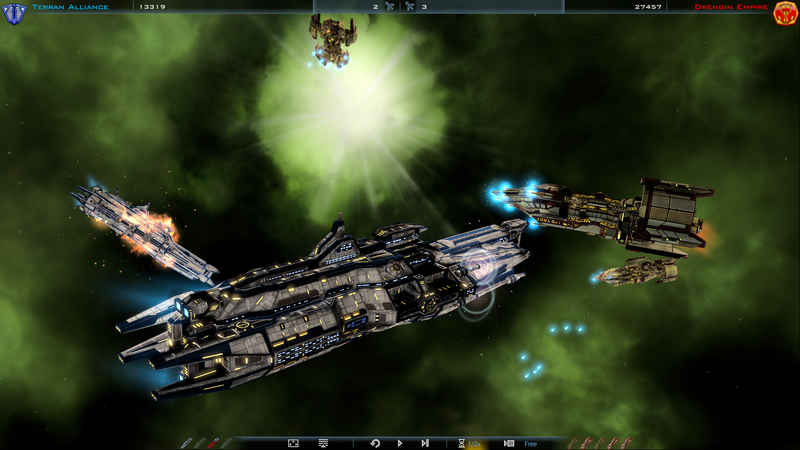 For more information on Galactic Civilizations III, please visit www.galciv3.com. Memory: introduced new texture compression for planetary and ship textures to greatly reduce memory usage and dramatically improve startup times. Multithreaded the texture loading at the start of game to improve performance. Auto Surveying Survey Ships will now survey extra anomalies if the ship has extra movement points. Made low level factories cheaper, provide smaller bonuses. 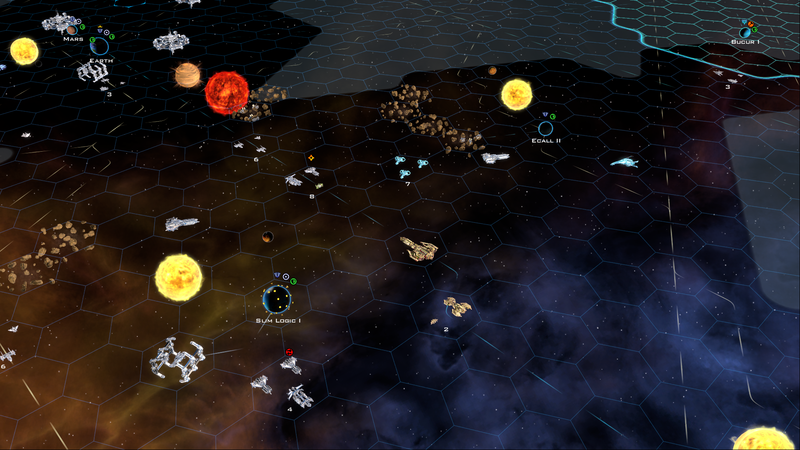 Reduced the size of maps while keeping the same number of objects, effectively increasing the galactic density. Lowered diplomacy bonus of the Diplomacy Techs. Eliminated the Influence Bell Curve target divisor. Colonies now instantly update when you rush build to show the effect of the new building. Minor races will now establish trade routes. Tweaked influence such that growth is now slower in general, but influence improvements and modules are now much more powerful. Increased starbase spacing by to 3, from 2, until we get the new Administration cost stat implemented. Adjusted intensity on several strategic map icons and the grid. Starbase minimum distance reduced from 5 to 3 tiles. AI tends to focus more on tech (generally) than previously. AI will build survey ships late ingame. 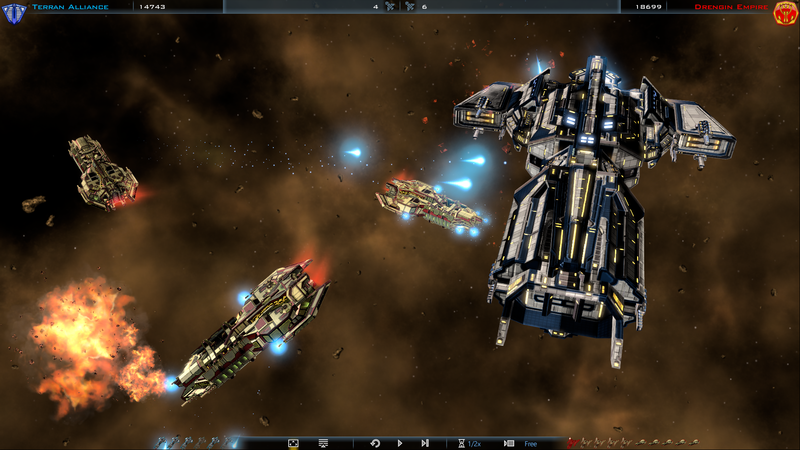 AI provided with a much wider variety of ship designs to choose from with the various strategies. AI weights units much more closely than previously in order to not make one virtually impossible to build. Opposing culture diplomatic penalty reduced from 1.25 to 1.1 if AI is benevolent. Opposing culture diplomatic penalty increased from 1.25 to 2 if AI is merciless. Opposing culture diplomatic penalty increased from 1.25 to 2 if AI is cruel. Close to victory diplomatic penalties increased from 1 to 5. Ripe for conquest diplomacy penalty reduced from 0.75 to 0.1 if AI is benevolent. Ripe for conquest diplomacy penalty increased from 0.75 to 1.25 if AI is aggressive. Minimum planet class to be a manufacturing world reduced from 7 to 4. Max number of colony ships the AI will construct at once increased from 2 to 3. Max slider focus reduced from 95% to 75% (to deal with coercion penalty). Coercion forgiveness eliminated (there is always some coercion if you move off from center). Maximum coercion reduced from 50% to 35%. Colony Capital production points reduced from 5 to 1. CivilizationCapital production points reduced from 5 to 1. Influence Radius root increased from 1.75 to 4 (i.e. influence ZOC will start out much much smaller now). Tech inflation penalty significantly reduced. Penalty for switching a constructor to a colony ship increased from 50% to 75% (yea, you know who you are). Pirates moved further away from starting location. Increased the variance for the various settings (minors, pirates, etc.). Modified the governor script to provide a bit more flexibility based on planet bonuses when building improvements. Colony capital hub provides a 2 (was 1) level bonus to adjacent buildings if they are population or manufacturing or research. Civ capital hub provides a 3 level bonus (was 1). Reduced maint. slightly on research buildings. Rare habitable planets decreased from 30% to 25%. Nebula and black holes and anomalies made much less common on all settings. Occasional planet frequency amount doubled from 1X to 2X. Common stars modifier increased from 0.9 to 1. Common planet frequency amount increased from 0.75X to 3X (this also fixes a bug where common was less than occasional). Abundant stars increased from 1X to 1.5X. Planet Frequency increased from 0.25X to 3.5X (also fixes bug). Tiny map base objects increased from 32 to 120 (i.e. tiny maps will be a lot more filled). Small map base object count increased from 64 to 150. Medium map Base object count increased from 110 to 200. Large map base object count increased from 155 to 300 (i.e. over twice as many stars/planets/etc. in a particular size). Huge map base object count increased from 250 to 350. INSANE map object count INCREASED from 1200 to 1400! Sensor cost components reduced slightly. Cargo module cost reduced from 27 to 10 (cheaper colony ships -- but remember, planets now rely more on population for their production). Tiny hull cost reduced from 11 to 10. Small hull cost reduced from 25 to 20. Medium hull HP increased from 100 to 120. Large hull cost increased from 128 to 300. Large hull HP increased from 250 to 600. Large hull storage increased from 100 to 120. Large hull logistics cost increased from 7 to 10. Huge hull cost increased from 432 to 500. Huge hull HP increased from 500 to 800. Huge hull storage increased from 250 to 300. Huge hull logistics increased from 10 to 16. Cargo hull cost reduced from 42 to 24. Cargo hull HP reduced from 10 to 1. Cargo hull logistics increased from 5 to 6. Escape key now prompts the user if they are designing a ship, instead of instantly leaving the view. Added an option skip the upgrade notification on the starbases window. Fix some bad prerequisites some hidden minor race tech tree. Fix bad tech description for Technological Outreach tech, in the Torian Tech Tree. Added check in Galactic Events that prevent random crashes with event that pops up twice. Fix bad prerequisite for Xeno Geology in the Arcean techtree. Fix bad prerequisite for Drengin Manufacturing Stimulus. Removed normal map corrections and Lean Maps from game as they didn't look good and were taking up too much space. Fixed bad normal map for merc textures. Fixed issue in Krynn tech tree causing the Coordination Temple to be hidden. Fixed some issues that were causing some of the techs at end of the tree to have the wrong cost calculated. When vram is maxed out, the game will no longer generate a massive log file. Added author fields for maps, factions and ships. 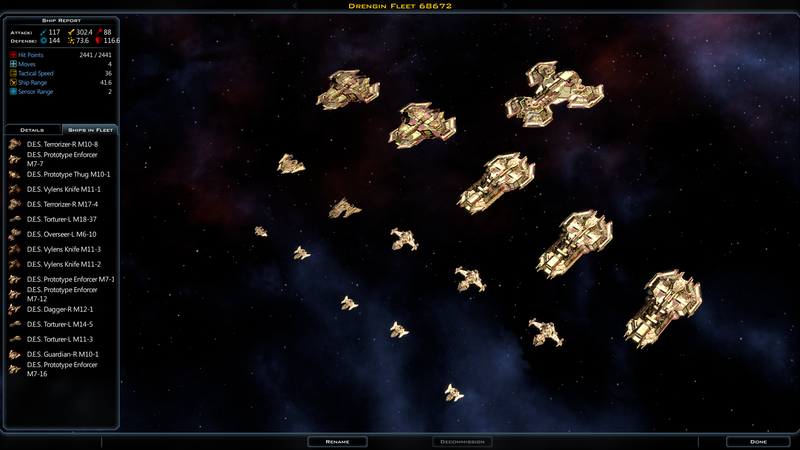 Starbases will now notify the you that they need to be upgraded after being initially built. Fixed double counting of trade routes for AI diplomacy purposes. Fixed late game crashes related to textures on large maps. Fixed an infrequent crash on loading large maps. Fixed bug that could cause the AI to see tiles in the opposite map position of where they were exploring. Fixed a bug that could cause the AI to reduce the priority weighting on colony ship production based on the # of targetable planets. If a player faction is set to random in the prefs.inifile, the quick-start tooltip will no longer display an invalid faction. Fixed an issue where if you changed the planetary spending wheel, the displayed. manufacturing time for improvements wasn't being updated at the same time. Clicking available projects tabs no longer resets the improvement cursor. Add ESC to close Ship Designer and Diplomacy screens. Starbases no longer incorrectly show the upgrade option when none avail. Fixed a crash related to the AI defying the UP. Great patch! Was research speed addressed as well? Still not seeing anything about shield punch getting a fix. Because it still doesn't work. And now, after many years of haranguing that mods are annoying distractions that 'pollute' the game, I've installed my first one ever. Those linen-that-got-into-a-hot-dryer maps made me instantly claustrophobic. Thanks, Old-Spider. I may go that way as well, I normally dislike mods and wish to play the game as intended but, with Stardock quiet on why this was a good thing to pull back the map sizes 18 months after release may require me to go for a mod. It seems that no one here is happy with the drastic size changes. I used to play (v1.8) Huge using my custom race and letting all 12 AI's play and a common # of stars and planets. 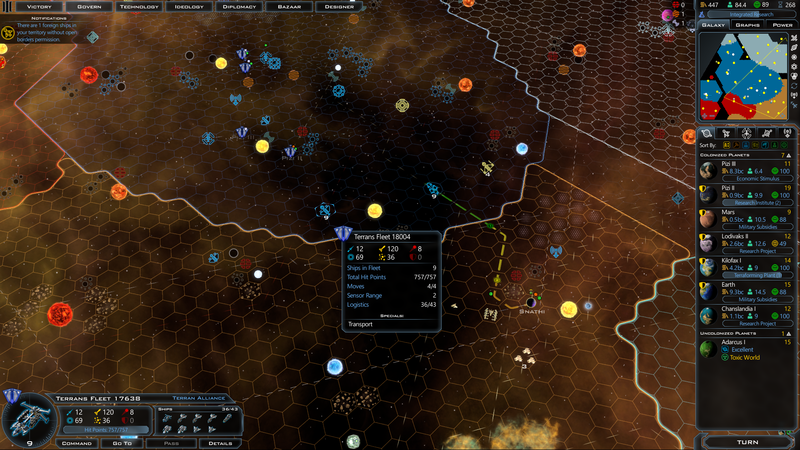 I had to launch 3 games finally settling on Huge vs 7 AI's with Abundant Stars and planets. Things still seem too tight. I toned difficulty for me down from Godlike to Incredible as I am rusty and also fear the production nerf will slow me. I managed to colonize 5 new planets only! The number would be less than that but 3 were in the same rather nearby system. The AI does seem to be a bit better with their colony rush as well. I've asked this in the past, with not much response, why do you continue to answer more on Steam and, less and less on your actual forums. I just went to the Steam forums to see that you have replied several times to peoples concerns about the map sizes there but, have said very little if any here on your forums. I know maintaining 2 forums can be a chore especially when receiving the same types of feedback, however, here is where you have your more loyal fans (normally) yet we're stuck searching for answers ourselves. Next, what is the point of providing the opt-in options for features? These concerns were brought up prior to making the patch public both while Frogboy was testing on his own and 2 days prior to releasing 1.9 when that was added to the opt-in. Addressing these concerns at that time with either constructive conversations about it or future plans on what may be going on in the future with map sizes may have cut back on the negative posts both here and on the Steam forums. I'm all about moving forward and I believe this patch is a huge step in the right direction, with the exception of the map sizes. I am also all about making the game great after all as a founder with all the other founders we have invested interest in the game success going forward, please at least consider our concerns as typically if are feeling that something may be looked at negatively it's a good sign that the average player is going to look at it negatively. Last point, how can we as founders provide better feedback or constructive criticism to you as developers to help minimize negative views to the game and ultimately help increase revenue and profits of the game? I know that sometimes I jump to the most negative points as well which I can continue to work on but, I hope the community can still work hand in hand with you as developers going forward. We are listening to feedback on both the forums on this and other issues. I haven't been purposely been focus on steam vs. local forums, but I'll try to respond more evenly. But we are monitoring your responses and listening. We'll be making changes "soon"
I'm going against the grain here, but overall I'm not having a problem with the way maps have been re-scaled. My initial impressions starting up a new game is fairly positive regarding the density of the new maps. If anything, I see it as an opportunity to perhaps expand with more map size options. I guess, ultimately I have been seeing more interaction between factions and being forced to consider my expanding perhaps a little more quickly, because they AI certainly seem more aggressive in its expansion. 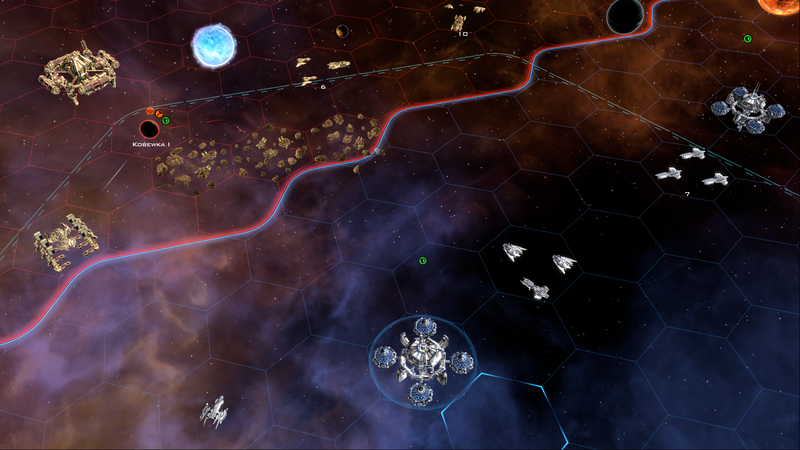 One of the criticisms I have had with GalCiv 3 in the past is that AI, especially those stuck on a map 'island' don't seem to push out much if at all, and so there are less power shifts and conflicts, expansions, etc. I guess I can understand that it feels like they're is less of a sense of discovery in the early game because space is not as sparsely populated between systems. Well at least with default settings. I think we could use more discussion. Getting stuck on wait all the time with a new game with this latest patch. The current game i can only go 1 turn and then it's stuck yet again. So how do you get it!!!!!!!!!!!!!!!!!!!!!!!!!!!!!! If you and your Steam client are online, you already have it! If you start up the game and get the new launcher, that will confirm the update.